In this post I’m going to show you an example usage of ViewPager in conjunction with ActionBarSherlock tabs. Note that using ActionBarSherlock requires you to use one of these themes: Theme.Sherlock, Theme.Sherlock.Light, Theme.Sherlock.Light.DarkActionBar, or any other derivate, otherwise a RuntimeException exception will be thrown. Another requirement in order to use Sherlock library is that your activity should extend from SherlockFragmentActivity, and this is what MainActivity does first. In short, a ViewPager is a layout manager that allows you to swipe left and right through pages of data. It needs to be supplied with an implementation of PagerAdapter in order to generate the pages that the view shows. For every string in the tabs array a new ActionBar.Tab is created and added to the ActionBar. 4. And the layout of MainActivity, R.layout.activity_main, which simply defines the ViewPager container. The PagerAdapter helps represent each page as a Fragment. getItem() – which returns a new fragment for each page. 6. Bellow follows the fragment classes used for representing each page. The minimalistic implementation is to extend from SherlockFragment, and provide a view for the fragment itself. 7. And their corresponding layout files, which in this particular example have just a single TextView element. Thanks for the great tutorial. It is incredible that when such few code you can do such great job. I have forked your project and made few changes. 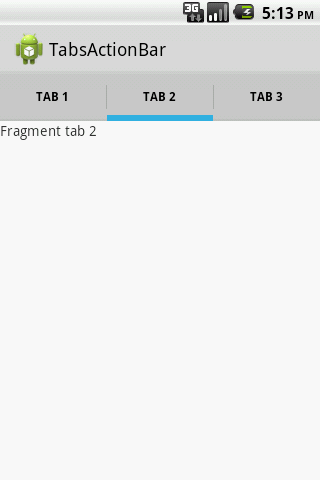 Now by changing the variable tabs in the mainActivity the app will show the number of tabs according to it. I have also changed the fragments. Now there are two fragments: White fragment, which has white background and black text; and black fragment, which has black background and white text. This is because the number of fragment is not fix, they will be alternated and by changing the background, it will be easier to identify them. How to set these tab at bottom position?